No language in this provision  permits the governor to selectively adopt some components of the bill while rejecting others. To allow such picking and choosing would, in effect, empower the governors with a line-item veto authority that President Obama himself did not possess at the time he signed the legislation. 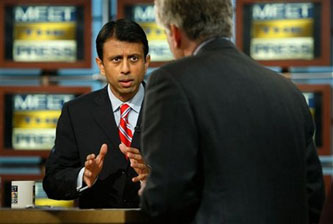 Take that, Bobby Jindal! Or, rather, thanks, Chuck Schumer! After all, if Schumer is right, it means that guys like Jindal are off the hook. “I tried to be fiscally responsible, folks, I really did, but the Democrats didn’t give me any choice.” Long sigh. “So I guess I’ll have to take all their money after all.” Even longer sigh. BERNANKE: If unemployment benefits are not distributed to the unemployed, then they won’t spend them and it won’t have that particular element of stimulus. SEN. JACK REED (D-RI): So if this was done on a wide basis, it would be counterproductive, not productive? BERNANKE: It would reduce the stimulus effect of the package, yes. If you have some principled objection to the idea that fiscal stimulus works, then fine. But if you don’t, there’s no reason to object to extended unemployment benefits. In terms of bang for the buck, it’s probably one of the best uses of stimulus funds in the entire package.